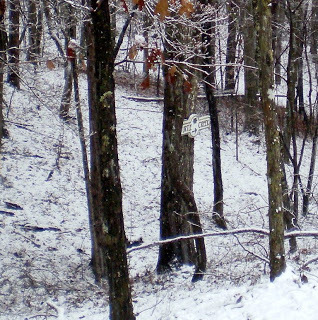 I remember when I was a kid… And on the news, those venerable, gray-haired weather men would swear that we would awake to a White Christmas. It never happened. Christmas in Georgia is almost always – a rainy 47 degrees…. you can count on it. I’ve always considered it a very cruel joke that children in the South get sleds and toboggans for Christmas. We even got those aluminum disc sled things one year. We used them once and it really wasn’t even snow… it was just that slushy glop covering the ground just enough to turn the underlying red clay into slick putty. It was probably just as well – the back yard was a 60 degree slope terminating at a perpetually icy, fresh-water spring…. We would have died of hypothermia. They mostly just hung in the garage. It became one of those things that never got used. I remember my brother Ed trying to convert one into a parabolic mirror…. lord only knows what he was going to do with it if he ever got it to work.. I could picture him frying squirrels out of the trees like ants under a magnifying glass. ….it’s still snowing… so we aren’t going to make the trip……. I’m missing the roast… oh, right… and the, umm, family thing, too…. We are, however, still cooking the squash. 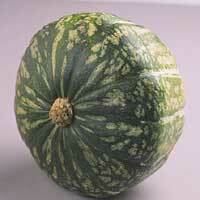 Buttercup Squash are a smooth textured, slightly sweet, orange fleshed, marrow squash. It is more similar to a butternut than an acorn, and about the size of a squished-down soccer ball. Mom’s idea was to curry it, so I set about looking for a recipe that would handle the texture and flavor without over-powering it. Curries can be assaulting if not handled properly. The recipe is an amalgamation of about five different recipes.. most I found were just too intense, so I’ve adjusted ratios and made substitutions to suit our taste. The end product is rich, creamy, slightly spicy and just enough kick to stand up to a fairly robust meal. 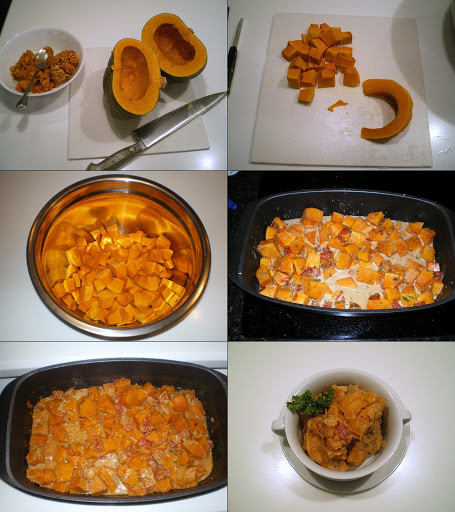 Puree the squash after baking and add 1 cup heavy cream and 4 cups chicken stock, and simmer for 15 minutes. Peel and Dice the squash. The best way is to halve the squash, scoop out the innards, then cut off workable 1/2 rounds off the body – it will make peeling it easier in the long run. Crush the cardamon pods with the side of a knife until they crack. Good to see you got some snow in your NEW backyard. Very cool We've got buckets of snow if you ever want us to ship you some. Happy Snow Fall. That's very cool. Is that a picture from your backyard?